Identification of therapeutic targets in a mouse model of PCD. (A) Left: CD8 (red) and Calbindin (green) in the cerebellum of a L7-HA-PCD mouse, 20 days. Scale bar: 25 μm. Right: enlargement of left shows 2 T cells in close apposition to a calbindin+ Purkinje cell. Scale bar: 10 μm. (B) Flow cytometry of α4 integrin (CD49d) expression on CD4 and CD8 T cells (CD90.2+) from the cerebellum and secondary lymphoid organs of L7-HA-PCD mice, 16 days after 4T1-HA tumor challenge and anti–CTLA-4 mAb (αCTLA-4) therapy. Left: dotted line, spleen; gray, cervical lymph nodes (cLN); solid line, cerebellum. Right: frequency of CD49d-positive cells among CD4 and CD8 T cells from spleen, cLN, and cerebellum of 5 L7-HA-PCD mice. Paired 2-tailed t test, ***P < 0.001. 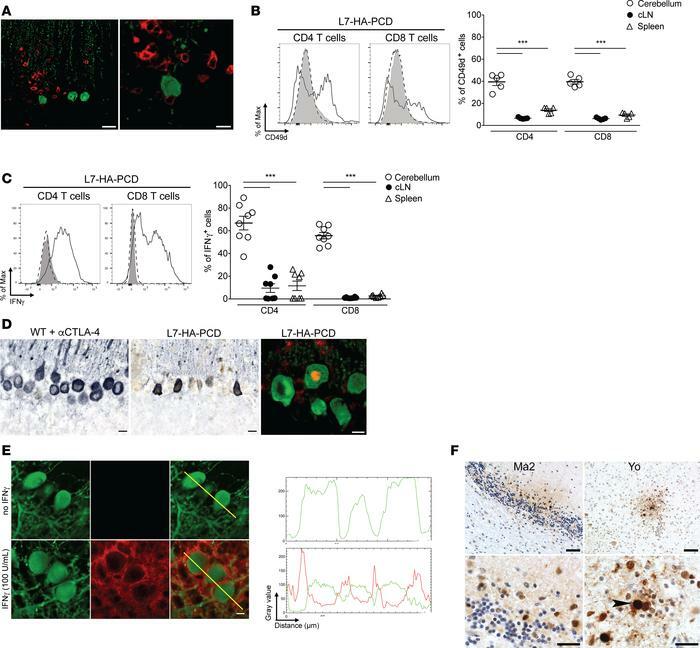 (C) Flow cytometry of IFN-γ expression in CD4+ and CD8+ T cells from the cerebellum and secondary lymphoid organs of L7-HA-PCD mice, following in vitro stimulation with the HA110–119 and HA512–520 peptides for 16 hours. Left: dotted line, spleen; gray, cLN; solid line, cerebellum. Right: frequency of IFN-γ–expressing cells in CD4 and CD8 T cells (CD90.2+) from 8 L7-HA-PCD mice. Paired 2-tailed t test, ***P < 0.001. (D) pSTAT1 (brown) and calbindin (blue-gray) on cerebellar sections of WT (left, WT; not expressing HA in Purkinje cells) and L7-HA-PCD mice (middle). Scale bar: 10 μm. Staining for Calbindin (green) and pSTAT1 (red) shows upregulation of pSTAT1 in the nucleus of a Purkinje cell (right). Scale bar: 7.5 μm. (E) Left: ex vivo cerebellar slices from L7-HA mice treated or not with IFN-γ (100 U/ml) for 24 hours and stained with an anti-calbindin antibody (green) and an anti–H2-Kd antibody (red). Scale bar: 20 μm. Right: densitometric analysis of calbindin and H2-Kd staining of Purkinje cells. Yellow lines: segments of Purkinje cells submitted to densitometric analysis of calbindin and H2-Kd staining (right panels). (F) Top left: pSTAT1 staining in the cerebellum of an anti-Ma2 case. Bottom left: enlargement of top left. pSTAT1 upregulation in the nuclei of microglial cells, astrocytes, and some of the granular neurons. Top right: local pSTAT1 in the cerebellar peduncle of an anti-Yo case. Bottom right: pSTAT1 is upregulated in various glial cells. In addition, pSTAT1 can be seen in the nucleus of a neuron (arrowhead). Scale bar: 50 μm (top left and right) and 20 μm (bottom left and right).